What is a care team? Ron Lutz provides a helpful definition at careleader.org. We notice several things from this definition. The context of a care team is an atypical, high-need situation. The care team is comprised of peer level members. A care team is created for short-to-mid-term, intensive needs. A care team is put together by a church leader, who the team looks to for guidance and their own care. This final point is the focus of this post: how does a pastor-elder care well for the care team created to come alongside a member in some form of crisis? The following three points are often overlooked aspects of caring for a care team. In the early stage of a care team, when each member and the team as a whole, are figuring out their role, this should be at least weekly. As a team gets used to their role, the frequency of this contact can cut back to twice monthly. The value of this contact is to help the care team realize they were not enlisted into a role and forgotten. Additionally, it can be a time to clarify the following two points. Often a care team is not given an outlet for their experience and therefore they become an “emotional swamp” (place of stagnant water/information that begins to feel dark and smelly). A care team member faces the Catch-22 of (a) they are not experienced bearing confidential information, and (b) they are being asked to enter a situation where someone is sharing emotionally weighty things because of the ministry capacity the church has placed them in. The pastoral follow ups above should not just ask, “how is [friend in crisis] doing,” but also, “how are you doing as you care for [friend]?” The pastor who recruited the care team should be at least one outlet for the care team member to debrief their experience. Not only is clarity needed, but also assurance that they will be supported in only doing what their care team role entails. Often the care team feels like they have to address every need that emerges instead of just being an emotional support and aiding with logistical needs. Crises have a way of creating a variety of needs. Sometimes it is within the capacity of the care team to meet a particular need; other times it is not. Sometimes it is “caring” to meet those needs; other times it can be “enabling.” When a care team feels like it is the expectation of the church that they meet whatever need arises (i.e., “blank check” assistance), the care team can feel burned and taken advantage of. Care teams are a wonderful expression of the love and compassion of the Body of Christ. 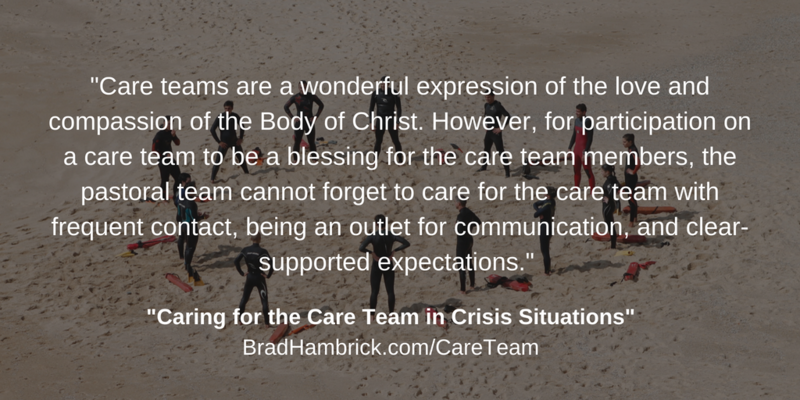 However, for participation on a care team to be a blessing for the care team members, the pastoral team cannot forget to care for the care team with frequent contact, being an outlet for communication, and clear-supported expectations.